With a 20-year heritage, ACID defined loop-based music creation. ACID Pro adds more creative tools, instruments and effects to become THE creative DAW for a new generation of artists and musicians. Experience unparalleled sequencing and loop-based music creation, more instruments and effects than ever but the same easy ACID workflow to create your musical dreams. ACID Pro offers complete MIDI sequencing, real time MIDI processing, ultra-precise editing and full MIDI automation. ACID Pro features unique tools like Beatmapper and Chopper to create impressive drum fills, stutters, and DJ effects for the ultimate remix experience. ACID Pro boasts an incredible new range of plug-in instruments. These include a performance sampler, analog synth and 13 amazing Vita Solo instruments that produce everything from rock drums to an ultra-realistic grand piano. 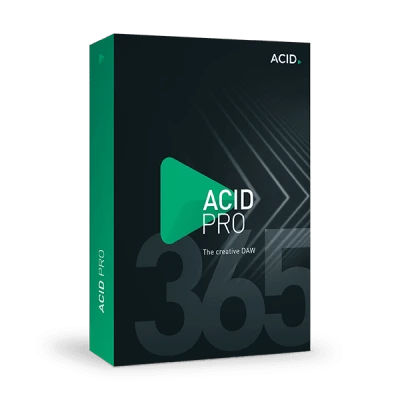 ACID Pro 365 is your subscription for innovative loop-based music production. Experience all the features of ACID Pro, like the new 64-bit engine perfect for large complex projects, the array of instruments and numerous effect plug-ins – all for only £1 for 3 months (that's just £0.34/month!). Once your first 3 months are complete, you can continue your subscription at only £9.99/month (that's just £29.97 for another 3 months).